There are many tools and resources out there to help protect you from becoming a victim of investment fraud. Be proactive and take some time to read these helpful resources today. Looking for more MSC brochures? To access all MSC brochures click here. 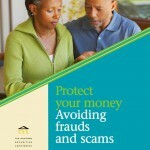 Questions on other types of fraud? There are many scams out there, being updated and created every day. Check this section for a list of common non-investment related scams. Why do people spend more time buying a new car or planning a vacation than investing their life savings? Most people know they should play a more active role in their investments but they often don’t know where to start. The Canadian Securities Administrators (CSA) have put together this guide to help you recognize and avoid frauds and scams. Our members include the 13 securities regulators of Canada’s provinces and territories. Canadian research suggests that 4–10% of older Manitobans will experience some form of abuse in their later years. 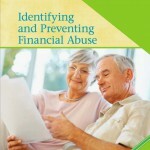 The most common type of abuse is financial abuse – the illegal or inappropriate use of a person’s money or property. Senior abuse can take many forms. 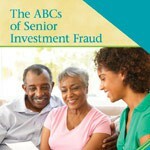 One of the most devastating and costly forms out there is investment fraud and scams. These can sometimes be perpetrated by people who are close to the senior such as family or friends, and more often than not is conducted by individuals who are not permitted to do business in Manitoba. When Your Adviser Calls, Take Notes! 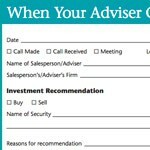 Make copies of this form to have handy and use it to make notes of conversations with your salesperson or adviser. Be sure to record details of the recommendations you receive and the instructions you give. Keep the notes in your ﬁles. The Internet is a quick and easy way for scam artists to find potential victims for their investment scams. With the Internet, fraudsters can operate anonymously from anywhere in the world, making them hard to catch. Scam artists prey on that fear by promising high-return, low-risk investments. In reality, these investments are usually high-risk products that are not right for people looking to protect their nest egg as they approach retirement—if the investment exists at all. Boiler Room Scams: Could You be Vulnerable? A team of scam artists set up a makeshift office, called a “boiler room” and work in stages. They might use a phony survey to find out about your investment experience, offer you free research, or try to get information like your mailing address, phone number and e-mail address.